Working closely with Rinpoche means that we always have to be prepared for a wide variety of situations. On any given day, we could be asked to do anything from rescuing animals to assisting Rinpoche in a funeral, to shopping for students to caring for sick people. No two days are ever the same and increasingly, as Rinpoche’s public profile grows, more and more strangers are approaching Rinpoche to seek his blessings and help. Rinpoche is always happy to help…but please remember your manners! It’s one of the reasons why Rinpoche goes out much less these days. It’s not that Rinpoche doesn’t want to help; because strangers constantly come up to Rinpoche and stop him, it is much harder to move around unimpeded and unrecognised these days. For whatever reason, when it comes to public figures, people lose all sense of social etiquette and assume that because you’ve put yourself out there, you’re at their beck and call for whenever they need help. Think I’m overreacting? Just yesterday, someone came to the Ladrang with his entire family and waited outside until Rinpoche was about to go out. When the gate pulled open, the whole family walked in and demanded to see Rinpoche. Think about it – would you behave that way with anyone else? Would you walk into a person’s house if they didn’t know you, and expect them to be okay with it? That’s normally called breaking and entering! So why do you feel you can behave that way with a monk? I know people may be desperate and we have to practise compassion, but I wish people didn’t forget their manners. It’s something I’ve had to get used to; no matter how demanding people are, we always have to be nice. So just a little plea guys – approach Rinpoche’s attendants instead. We aren’t trying to stop you accessing Rinpoche, but please have a little consideration and common courtesy for the lama’s nirmanakaya form. You’ll get the help you want and we don’t bite, I promise! Anyway, rant over! To be prepared to help Rinpoche whenever strangers approach him, a few of us have taken to carrying these pouches. I thought you might like a little insight as to why people around Rinpoche always seem to be carrying such large, heavy bags! The worst thing is coming across someone who needs help and not having the tools to help them. Rinpoche says we should always be prepared because some people only have one chance to come across the Dharma and if we lose that chance, we will lose them for many more lifetimes until they meet the Dharma again. That means many more lifetimes of suffering for a sentient being because we were too selfish to be prepared…it’s a heavy responsibility! So here it is, the insides of the bag of a lama’s assistant! 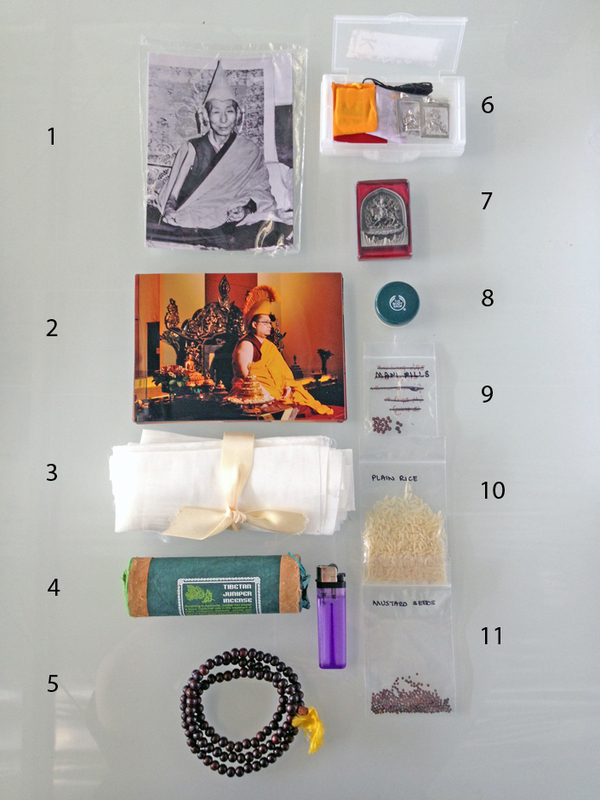 It’s a nice little pouch of all of the things we usually need when we’re out with Rinpoche. This pouch is in addition to the other things we carry – our notebooks, ballpoint and Sharpie pens, phones, sadhana book (though it’s now usually digitised into our phones hehehe), our mala, keys, battery packs and charging cables, wallets, cigarettes (for those who smoke)…and Rinpoche’s personal attendants carry even more because they take care of Rinpoche’s personal items too! And then there are our cars, which is going to require a whole new post! LOL! I was wondering what the Body Shop thing was. I thought was like Blessed Body Cream or something. It was a friend’s idea for me to use the sample tub! I thought it was genius because anything larger would be too much rice to carry around, and I would lose anything smaller!